Dr Clare Sansom reports on Birkbeck’s annual Rosalind Franklin Lecture, delivered this year as part of the biennial Institute of Structural and Molecular Biology (ISMB) Symposium. The lecture was delivered by Berkeley’s Professor Eva Nogales, a distinguished scholar in electron microscopy research. Since 2016, Birkbeck has held an annual lecture named in honour of perhaps the most famous woman scientist ever to work there: Rosalind Franklin, whose extraordinary, meticulous experimental work was a necessary part of solving the structure of DNA. This lecture is part of Birkbeck’s commitment to the Athena SWAN equality initiative, and is it given by a woman scientist distinguished in one of the disciplines represented there. 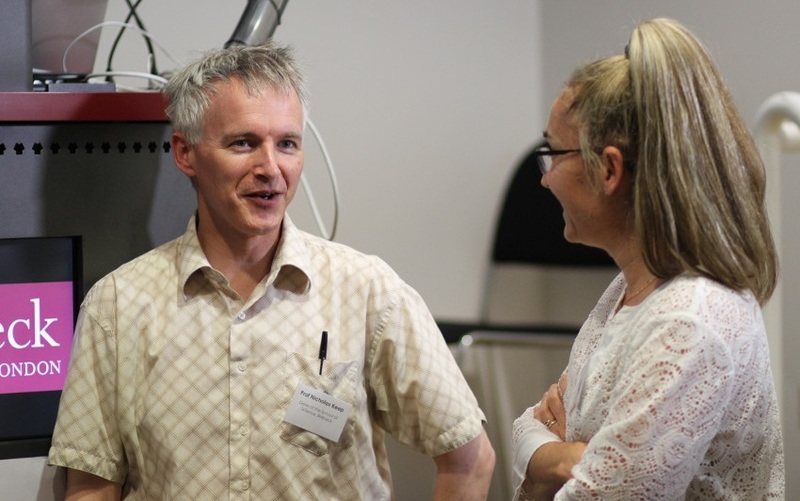 The 2018 lecture differed from its predecessors in forming part of both Birkbeck’s annual Science Week and the eighth ISMB Symposium. The Institute of Structural Molecular Biology (ISMB) is a centre of excellence, founded in 2003 to promote and integrate multi-disciplinary research in molecular, cell and structural biology in Birkbeck and its much larger neighbour, UCL. It holds a varied programme of events for faculty members, research staff and students; symposia, held in ‘even years’, are intensive conferences, generally held over two days and featuring talks from international research leaders. This symposium was held over two afternoons on Monday 18 and Tuesday 19 June, with the Rosalind Franklin lecture as the last one on the first day. In planning the symposium, its organisers chose to highlight one technique among all those available for researchers at the ISMB: electron microscopy, as used to study the atomic structures of large protein complexes and ‘molecular machines’. The Institute’s director, Gabriel Waksman, highlighted Birkbeck’s acquisition of a new and very powerful electron microscope – a Titan Krios – in his introduction as ‘something to celebrate’. According to the School of Science Facebook page, Birkbeck’s Department of Biological Sciences is the smallest UK university department to house such a powerful microscope, and it is only through the ISMB that it is able to punch so far above its weight. And the Rosalind Franklin lecturer, Eva Nogales from the University of California in Berkeley, was only one of several distinguished proponents of this technique to present their research during the symposium. Few women have achieved as much in electron microscopy research as Nogales. Following a short introduction by Professor Nicholas Keep, Dean of the Faculty of Science at Birkbeck, she began her Rosalind Franklin lecture with thanks. She paid tribute to two of the distinguished researchers present, Helen Saibil and Ken Holmes, describing Saibil, the Bernal Professor of Structural Biology at Birkbeck, as an ‘inspirational’ pioneering woman in electron microscopy. Holmes, who had given one of the previous talks at the symposium, worked with Rosalind Franklin as a PhD student at Birkbeck in the 1950s and went on to make ground-breaking discoveries about the structure of the muscle protein, actin. Nogales’ main theme during her lecture was her lab’s efforts to decipher the structures of several large, multi-protein complexes that are involved in the process of gene expression. The different types of cells in our bodies – with a few odd exceptions, such as cancer cells – all contain exactly the same DNA in the chromosomes in the cell nucleus. What makes a brain cell differ from a bone cell or a heart call is how the information carried by the genes on those chromosomes is expressed in the functional molecules, mainly proteins. Only a fraction of the genes in a genome are expressed in a given cell at any particular time. Gene expression is the term given to this incredibly complex and exquisitely sensitive process, which can be divided into two stages expressed simplistically as ‘DNA to RNA’ and ‘RNA to protein’. Work in the Nogales lab focuses on two protein complexes that are involved in the first sub-process, the transcription of the DNA sequences of genes into RNA. These bear the rather cumbersome names of polycomb repressive complex 2 (PRC2) and transcription factor II D (TFIID). If the DNA in each human chromosome could be stretched out it would measure tens of centimetres in length. It is packed and compressed to fit into the microscopic cell nucleus by winding around histone proteins to form circular units of structure called nucleosomes. Proteins in the ‘transcription machinery’ can only access the DNA to start gene expression if these are loosely packed. PRC2, as its full name implies, represses this process: it does so by adding methyl groups to the alkaline lysine residues of the histones, making the nucleosomes pack more tightly together. The protein complex therefore forms an ‘on-off switch’ for gene expression. Disrupting its function can lead to the uncontrolled cell growth and multiplication that is characteristic of cancer cells and it is therefore a useful target for the design of anti-cancer drugs. Nogales explained that PRC2 is a very large protein complex and that determining its structure using electron microscopy presented a considerable challenge. The first structures, obtained before the ‘resolution revolution’ in this technique, could only show separate protein molecules as ‘blobs’: later, better structures that revealed the positions of individual atoms proved that these were ‘accurate but not very precise’. The complex is now known to exist in several distinct structural states and to be able to add methyl groups (‘active’) in two of them. The main difference between these is in the position of one helix, which is bent against the rest of the molecule in the ‘compact active’ conformation but straightens away from it in the ‘extended active’ one. PRC2 binds to two protein co-factors in ways that mimic the binding of the flexible ‘tails’ of the histone proteins in methylated and unmethylated forms respectively. She then showed some even more impressive structures to explain how the complex interacts with nucleosomes. One complex binds between a pair of nucleosomes, and as long as the DNA that links the two is the right length, binding the first nucleosome positions the second so that the right amino acids are brought into the right position in the PCR2 active site for methylation to occur efficiently. The second complex discussed, TFIID, is active exactly when PRC2 is not, as its presence is necessary to begin the process through which DNA is transcribed into RNA. This begins with the step-by-step assembly of proteins close to the position on the DNA where transcription is due to start, forming a ‘preinitiation complex’. TFIID is the first component of this complex to assemble, and this ‘nucleates’ the complex by recruiting other transcription factors so RNA synthesis can begin. Nogales described distinctive structures of parts of the preinitiation complex obtained by members of her group, finishing by showing some unpublished work on its structure and dynamics that included this vital component. If this fascinating lecture has inspired the many young electron microscopists in the audience as much as Helen Saibil’s work inspired Nogales, then the future of the discipline will be in good – and often female – hands.